Last month, the Empire State Manufacturing report eked out a small gain, giving economists grounds for optimism in the manufacturing sector. This month, the index plunged nearly nineteen percentage points to -14.92, well below the lowest Bloomberg Econoday Estimate of 3.0. Out of the blue, the Empire State index has plunged deeply into negative column this month, to minus 14.92 in August vs plus 3.86 in July. This is by far the weakest reading of the recovery, since April 2009. New orders, which had already been weak in this report, fell from July's minus 3.50 to minus 15.70 for the weakest reading since November 2010. Backlog orders, which had also been weak, came in at minus 4.55 from minus 7.45. Shipments, in the weakest reading since March 2009, fell to minus 13.79 from positive 7.99. Last week's industrial production report, boosted by the auto sector, offered hope but today's report is a reminder that weak exports and weakness in the energy sector are stubborn negatives for the factory sector. Today's results scramble the outlook for Thursday's Philly Fed report which was expected to show moderate strength. Reader Tim Wallace pinged me with this comment: "Only weather forecasters and economists get to miss their forecasts by so much." The above chart from the Empire State Manufacturing Report. 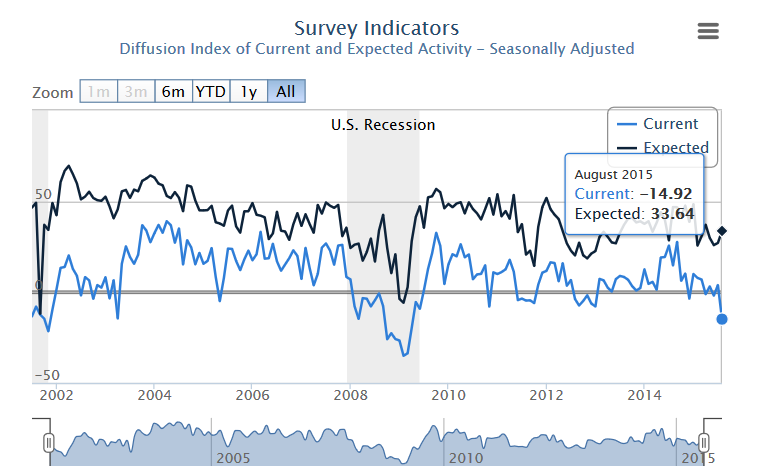 The headline general business conditions index tumbled nineteen points to -14.9, its lowest level since 2009. The new orders and shipments indexes also fell sharply, to -15.7 and -13.8 respectively, pointing to a marked decline in both orders and shipments. The inventories index dropped to -17.3, signaling that inventory levels were lower. Price indexes showed that input prices were slightly higher, while selling prices were flat. Labor market indicators suggested that employment levels and hours worked were little changed. Indexes for the six-month outlook registered somewhat greater optimism than in July, with the future general business conditions index rising seven points to 33.6. The chart shows perpetual optimism in expected conditions vs. existing conditions. There is absolutely no reason to believe manufacturing will dramatically improve. Instead, there is every reason to think manufacturing will get worse, led by autos. As I have pointed out, record or near record auto sales will not go on perpetually. Yet the preponderance of economists seem to believe it will. When autos turn, the Fed will be in for a rude awakening.